- economy of liquid boiler fuel (fuel oil, boiler fuel, heating oil, coke fuel coal tar fuel ) in industrial boilers and furnaces. - pretreatment fuel to increase caloric and complete combustion. - for reduce the carbon deposits on the surfaces of heat exchangers, reducing clogging in atomizers and fuel burning intensification. Homogenizer, disperser TRGA - best energy saving technology and equipment for highly viscous and fluxion liquids. Homogenizer, disperser TRGA - long-term reliable operation, improving the properties of the boiler and ship fuel. it is - only a small part of photos and documents that are available to us. it is only part of the installed equipment, which owners have sent us photos, reports, reviews and test results. Homogenizer, disperser TRGA - installed on existing or additional pumps in the tank recirculation fuel line. Some examples of installing homogenizer TRGA as systems preparation of fuel for industrial boilers and furnaces. It is - only a small part of photos and documents that we can show. On photos - examples of different fuels before (left) and after (right) processing by modules, with homogenizers TRGA-3G. The increase 150 times. Fuels (top to bottom) - coal tar pitch, hydrocarbon fuel. The intensity of exposure to solid fuel particles - is directly proportional to their size. Result - milling particulate resinous compounds, as a consequence - the decrease in viscosity, pour point decrease in the rate of clogging atomizers and unburned fuel which pollutes the heat exchange surface. Decrease smoke emission. Proven result - fractional change the composition and the formation of additional light (diesel) fractions by partial destruction of heavy hydrocarbon molecules in the range of 2-4%, depending on the fuel composition. Water-oil emulsions, which are made on the modules - homogenizers TRGA, with indoor and outdoor (with to freezing) temperature storage are stable from August 2008 to May 2013. For this reason, the use of homogenizers TRGA, for pretreating boiler, marine and diesel fuels efficiently and economically proven. Homogenizers TRGA - successfully solve the problem recycling of bottom water. Vladivostok, Russia, 2015, homogenizer TRGA test results - increase in thermal efficiency of hot water boiler, reducing the speed of clogging of nozzles, the ability to reduce the diameter of the injector nozzle by 60%. Plesetsk Russia, 2015, oil sludge from open storage pits. homogenizer TRGA reliability of 3 years of work on the oil sludge in open pits. Irkutsk, Russia, 2015, workshop repairs of locomotives of Russian Railways. Safe operation on the watered black oil without clogging, with minimal maintenance. Krasnodar, Russia. 2015. Equipment for manufacture (quality improvement) of bunker fuel. Result - reducing the number and size of the solids, reducing the pour point without using additives. Plesetsk Russia, 2015, oil sludge from open storage pits. "Before" and "after" processing homogenizer TRGA. simple test - wetting and burning rags. Comparative photos and movies. Product and combustion - before and after treatment. Samara, Russia, 2015, Project "Volgotanker". "very sensitive to Russian fuel oil." Odessa, Ukraine, 2012-2016. Model project for ports and tank farms. Fuel economy and recycling waste oil residues and oiled condensate water, waste and bilgewater in the ports and tank farms. Full report. Okhotsk, Russia, 2013-2014, till this day. TRGA system for light fuel economy on stationary generators - power stations. 6 months later, after buying the first device - the company bought another 5 devices. Decrease in specific consumption of diesel fuel on diesel generators. Jamaica, 2013-2015, an aluminum smelter. After the first year of work, the company bought 3 our devices more. Purpose - boiler fuel economy, reducing smoke, possibility of long-term working without smoke, cleaner heat transfer surfaces. Feedbacks forbidden to publish. Russia, Khabarovsk, 2013, the stationary unit for the treatment of fuel prior to combustion in the supply tank. Burning watered mazout and utilization of sludge and bottom water. Fuel type - watered mazout heavy fuel oil. Increase calorie of black oil after treatment by 4%. Ukraine, Crimea, 2013, stationary installation for the production of high-octane gasoline. Equipment for manufacture blending gasoline. Fuel type - straight-run gasoline, blending high-octane gasolines. Russia, Stary Oskol, 2013, the stationary unit for the treatment fuel before combustion in the storage tank. The possibility burning fuel oil after 10 years of storage. Fuel type - watered mazout heavy fuel oil. Report. Russia, Vladivostok, 2012, asphalt plants, furnaces, stationary installation for processing the fuel before combustion in furnaces. Full removal smoke, reducing the flow section in the atomizers. Fuel type - watered heavy fuel oil. Report. Film. Type of fuels - oil sludge. Report. Syria, Aleppo, 2012. Creating and burning water black oil emulsions. Mobile installation on the vehicle. Heavy flooding consumption by 15%. Summary results - successful burning fuel economy. Some Photos. Some Films . Very interesting ! Syria, Aleppo, 2012. Create burning water-oil emulsion. Flooding of heavy fuel by 25%. Summary results - successful burning, fuel economy, perfectly clean heat exchangers. Photo. Syria, Aleppo, 2012. Creating a water black oil emulsion. Stationary installation for feed tank. Flooding of heavy fuel is 20%. Equipment exploited by for several months. the time of stability synthetic water-oil emulsion in the supply tank 10 days - it is enough that it completely burn. No additive. Technology and equipment for water-fuel, water-oil emulsion and successful burning, fuel economy, perfectly clean heat exchangers. Turkey, Batychim, 2011, a cement factory, a private company, the stationary equipment for manufacture of water black oil emulsions. The best recycling technology. Real energy saving technology. More. Fuel type - flushing water, bilge water port waters oiled water. Russia, Vologda, the area in 2011, a private company, a mobile equipment for manufacture of water black oil emulsions. Has worked one year. Type of fuels - oil sludge. Russia, Sayanogorsk Aluminum Plant, 2011. Fuel type - watered viscous oil. Stationary installation in black oil in pumping station. Report. Russia, Rostov region 2011, a private company, a mobile system for the treatment of liquid sludge and mixing them with fuel oil. Russia, Saint-Petersburg 2011, stationary installation to produce silicone emulsion with high viscosity additives. Russia, Samara, 2010, a private company, a stationary module for processing fuel in the recirculation line of supply tank to reduce atomizer clogging. Ukraine, Illovaysk, Donetsk region, 2010. Stationary installation in point preliminary preparation of fuel. Fuel type - Kazakhstan highly viscous black oil with a pour point +42 degrees. Kazakhstan, Alma-Ata, 2010. 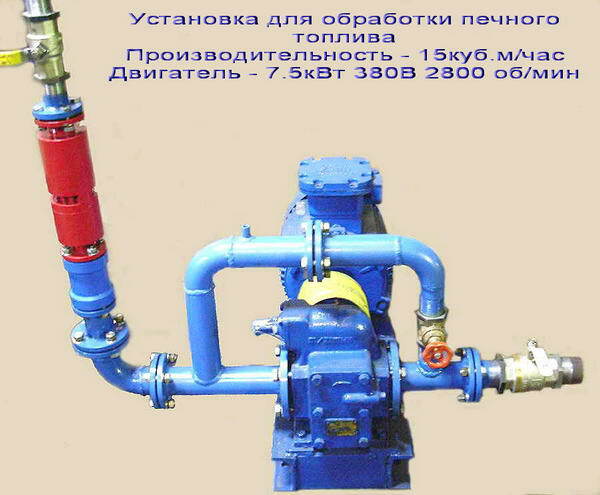 Stationary installation for increase the output of diesel from crude oil. No data available. Fuel type - Kazakh heavy waxy oil. Ukraine, Donetsk region, 2010. Stationary installation for the treatment of coke fuel. No data available. Fuel - Coke fuel and oil sludge. Syktyvkar, 2010. Stationary installation for the production of fuel oil from the sludge of open storage. No data available. Fuel type - slime watered open storage. Ukraine, Lviv region, 2010. Restoration of the properties of the old heavy fuel oil after prolonged storage. Has worked 6 months, then there is no data. Fuel type - old black oil long-term storage. Type of fuel - black oil, light oil sludge, waste, multi-blended fuels oiled water ... Photo. Kazakhstan, Ekibastuz, 2009, the processing of coal tar pitch before the sale, in order to use tar as a substitute for boiler oil. Stationary installation in point preliminary preparation of fuel. Has worked 3 years, technical heart of the business. Type of fuel - coal tar pitch. Ukraine, Mariupol, 2009. Mariupol trading port. Works till today, report. Fuel - a mixture of fuel oil and bilge water - fire utilization. Treatment the storage fuel tank. Summary results - successful burning, disposal of oiled water burning fuel mixture with a water content of 20% . Report. Russia, Chelyabinsk region, 2009. Mobile module for treatment of fuel on the customers location. Type of fuel - oil, oil sludge average quality. Russia, Belogorsk, the Amur region. 2009. working till feb 2016, photo received one and a half years after the operation of the boiler house and visiting delegation of Arcelor Mittal. Fuel type - watered black oil M100. Treatment of fuel oil in the storage fuel tank. Summary results - successful watered fuel oil burning. Russia, Samara, 2009, private enterprises, stationary stand for the selection of multi-component mixtures, analogues boiler fuel and water-fuel emulsions report. Fuel type - multi-blended fuels. Report. Fuel type - watered black oil M-100. No photos. No data available. Stationary installation to improve the properties of high viscosity black oil with high paraffin content in the mini refinery. Worked 2years. Type of fuel - black oil. Russia, Volgograd 2009, mini refinery for processing of diesel fuel after the column in order to reduce the pour point and adjusting the fractional composition. On the recommendation was purchased the same in Armenia. Type of fuel - diesel fuel. Ukraine, Dnepropetrovsk, OAO "Dneproshina," 2009, 1 homogenizer to prepare fuel in the storage fuel tank. Prevent deposition of fuel. . Fuel - oil, Coke fuel average quality. Operation of 24 months. TRGA-40, adjustable. Summary results - the successful burning of coke fuel. Report. Belarus, Brest, 2009, the municipal enterprise "Brest boiler" , the successful burning 750 tons old black oil with water content of 54%. Report. Working 2 year. The result - a successful burning watered mazout. Fuel type - watered mazout. Report. Serbia, Sremska Mitrovica, 2009, the municipal enterprise "Pannonian power chains," 12 months working, 2 testing from Nikola Tesla's lab.. Fuel - black oil M100. Water-oil emulsion. TRGA-10, adjustable. Results Summary - 2.6%-5.5% fuel savings, reduced NOx, SO2, CO. Test. Report. Ukraine, Dnepropetrovsk, 2009, the company "BIODIESEL Dnepr" stand for making fuel blends, emulsions, and compositions. The first models TRGA-3 series. Fuel type - M100 black oil, biodiesel, diesel fuel, fuel mixture. Later tried to claim as its own technology. Ukraine, Cherkassy, Cherkassy Plant of Construction Materials, 2008, the pilot plant to improve the properties and dewaxing of diesel fuel. TRGA-10, adjustable. Was working 3 years. Ukraine, Kirovograd, 2008, for the installation of for making a multi fuel stove. TRGA-10, adjustable. Was working 3 years. Turkey, Denizli 2008 system for for making fuel blends, emulsions, and compositions. TRGA-10, adjustable. Was working 3 years. In 2010 the firm purchased TRGA-3G-10. Ukraine, Odessa, 2008, the Odessa plant food oil, compositional fuel mixture of fuel oil and waste grease and oil. TRGA-40. Was working 2 years. Ukraine, Donetsk, 2007, the first sold homogenizer TRGA-40. Adjustable model. Type of fuel - gasoline, the introduction of high-octane gasoline additives after standard CSS. Subsequently used to liquefy heavy fuel oil from Kazakhstan's high paraffin content. Later, this group acquired an additional 3 homogenizer different designs. Was working for 4 years. burning black oil samples "without" and "immediately after processing"
All pictures taken on objects are installed activators of fuel series TRGA-3G.